When Anna turned 30 she had an afternoon tea party at her house, and with plenty of guests she had asked a few of us to help with the baking. Ian’s mother made lovely scones, lemon drizzle cake and coffee cake. Anna and her mother made blinis with smoked salmon and sandwiches (ham; egg salad; smoked salmon) and I made a quiche. 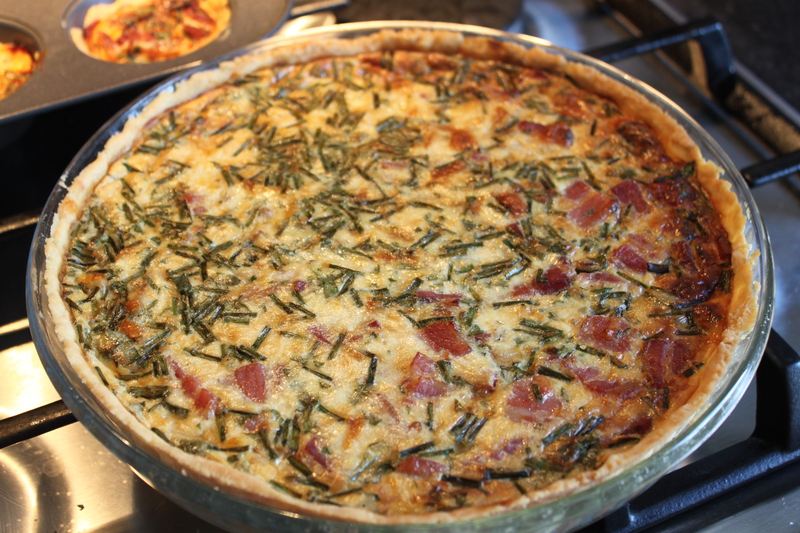 Quiche Lorraine is a French classic containing bacon and cheese. 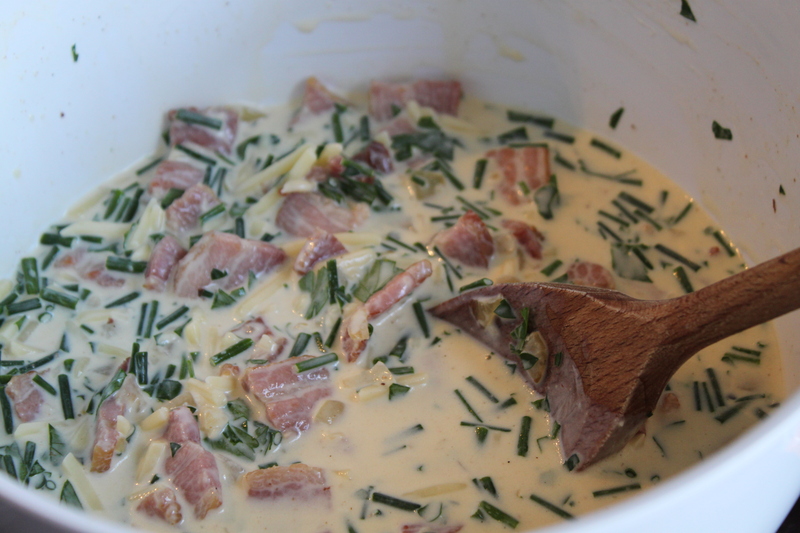 I also added chives and parsley to the cream mixture. I got plenty of compliments for the pie crust, which I was very pleased with, only a week after they made shortcrust in the great TV show The Great British Bake Off, so every one was well aware of soggy bottoms etc. Pinch together the ingredients for the dough, do not knead it. Place in the fridge for 30 mins-1 hour. Roll out the dough or push it into place in the quiche tin. Use a fork to make holes in the bottom, pre-bake in 180C for 10 mins. Fry the onion soft on medium heat. Place in a mixing bowl. Fry the bacon crisp in the same pan, remove to the mixing bowl and leave to cool slightly. Add the cheese, eggs, cream, herbs and pepper. Fill the quiche and bake for 35 mins in 180C (or until set and golden in colour). Enjoy it hot or cold or in between.